Language is tearing apart countries around the world, and the proponents of "Official English" may be ready to add America to the list. WE have known race riots, draft riots, labor violence, secession, anti-war protests, and a whiskey rebellion, but one kind of trouble we've never had: a language riot. Language riot? It sounds like a joke. The very idea of language as a political force -- as something that might threaten to split a country wide apart -- is alien to our way of thinking and to our cultural traditions. This may be changing. On August 1 of last year the U.S. House of Representatives approved a bill that would make English the official language of the United States. The vote was 259 to 169, with 223 Republicans and thirty-six Democrats voting in favor and eight Republicans, 160 Democrats, and one independent voting against. The debate was intense, acrid, and partisan. On March 25 of last year the Supreme Court agreed to review a case involving an Arizona law that would require public employees to conduct government business only in English. Arizona is one of several states that have passed "Official English" or "English Only" laws. The appeal to the Supreme Court followed a 6-to-5 ruling, in October of 1995, by a federal appeals court striking down the Arizona law. These events suggest how divisive a public issue language could become in America -- even if it has until now scarcely been taken seriously. Traditionally, the American way has been to make English the national language -- but to do so quietly, locally, without fuss. The Constitution is silent on language: the Founding Fathers had no need to legislate that English be the official language of the country. It has always been taken for granted that English is the national language, and that one must learn English in order to make it in America. History teaches a plain lesson about language and governments: there is almost nothing the government of a free country can do to force its citizens to use certain languages in preference to others. be able to preserve our language, and even our government will become precarious." Theodore Roosevelt articulated the unspoken American linguistic-melting-pot theory when he boomed, "We have room for but one language here, and that is the English language, for we intend to see that the crucible turns our people out as Americans, of American nationality, and not as dwellers in a polyglot boarding house." And: "We must have but one flag. We must also have but one language. That must be the language of the Declaration of Independence, of Washington's Farewell address, of Lincoln's Gettysburg speech and second inaugural." TR's linguistic tub-thumping long typified the tradition of American politics. That tradition began to change in the wake of the anything-goes attitudes and the celebration of cultural differences arising in the 1960s. A 1975 amendment to the Voting Rights Act of 1965 mandated the "bilingual ballot" under certain circumstances, notably when the voters of selected language groups reached five percent or more in a voting district. 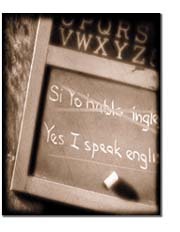 Bilingual education became a byword of educational thinking during the 1960s. By the 1970s linguists had demonstrated convincingly -- at least to other academics -- that black English (today called African-American vernacular English or Ebonics) was not "bad" English but a different kind of authentic English with its own rules. Predictably, there have been scattered demands that black English be included in bilingual-education programs. It was against this background that the movement to make English the official language of the country arose. In 1981 Senator S. I. Hayakawa, long a leading critic of bilingual education and bilingual ballots, introduced in the U.S. Senate a constitutional amendment that not only would have made English the official language but would have prohibited federal and state laws and regulations requiring the use of other languages. His English Language Amendment died in the Ninety-seventh Congress. In 1983 the organization called U.S. English was founded by Hayakawa and John Tanton, a Michigan ophthalmologist. The primary purpose of the organization was to promote English as the official language of the United States. (The best background readings on America's "neolinguisticism" are the books , by James Crawford, and , edited by Crawford, both published in 1992.) Official English initiatives were passed by California in 1986, by Arkansas, Mississippi, North Carolina, North Dakota, and South Carolina in 1987, by Colorado, Florida, and Arizona in 1988, and by Alabama in 1990. The majorities voting for these initiatives were generally not insubstantial: California's, for example, passed by 73 percent. It was probably inevitable that the Official English (or English Only -- the two names are used almost interchangeably) movement would acquire a conservative, almost reactionary undertone in the 1990s. Official English is politically very incorrect. But its cofounder John Tanton brought with him strong liberal credentials. He had been active in the Sierra Club and Planned Parenthood, and in the 1970s served as the national president of Zero Population Growth. Early advisers of U.S. English resist ideological pigeonholing: they included Walter Annenberg, Jacques Barzun, Bruno Bettelheim, Alistair Cooke, Denton Cooley, Walter Cronkite, Angier Biddle Duke, George Gilder, Sidney Hook, Norman Podhoretz, Arnold Schwarzenegger, and Karl Shapiro. In 1987 U.S. English installed as its president Linda Chávez, a Hispanic who had been prominent in the Reagan Administration. A year later she resigned her position, citing "repugnant" and "anti-Hispanic" overtones in an internal memorandum written by Tanton. Tanton, too, resigned, and Walter Cronkite, describing the affair as "embarrassing," left the advisory board. One board member, Norman Cousins, defected in 1986, alluding to the "negative symbolic significance" of California's Official English initiative, Proposition 63. The current chairman of the board and CEO of U.S. English is Mauro E. Mujica, who claims that the organization has 650,000 members. The popular wisdom is that conservatives are pro and liberals con. True, conservatives such as George Will and William F. Buckley Jr. have written columns supporting Official English. But would anyone characterize as conservatives the present and past U.S. English board members Alistair Cooke, Walter Cronkite, and Norman Cousins? One of the strongest opponents of bilingual education is the Mexican-American writer Richard Rodríguez, best known for his eloquent autobiography, (1982). There is a strain of American liberalism that defines itself in nostalgic devotion to the melting pot. For several years relevant bills awaited consideration in the U.S. House of Representatives. 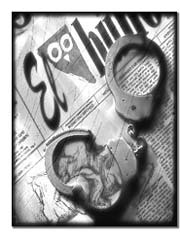 The Emerson Bill (H.R. 123), passed by the House last August, specifies English as the official language of government, and requires that the government "preserve and enhance" the official status of English. Exceptions are made for the teaching of foreign languages; for actions necessary for public health, international relations, foreign trade, and the protection of the rights of criminal defendants; and for the use of "terms of art" from languages other than English. It would, for example, stop the Internal Revenue Service from sending out income-tax forms and instructions in languages other than English, but it would not ban the use of foreign languages in census materials or documents dealing with national security. "E Pluribus Unum" can still appear on American money. U.S. English supports the bill. What are the chances that some version of Official English will become federal law? Any language bill will face tough odds in the Senate, because some western senators have opposed English Only measures in the past for various reasons, among them a desire by Republicans not to alienate the growing number of Hispanic Republicans, most of whom are uncomfortable with mandated monolingualism. Texas Governor George W. Bush, too, has forthrightly said that he would oppose any English Only proposals in his state. Several of the Republican candidates for President in 1996 (an interesting exception is Phil Gramm) endorsed versions of Official English, as has Newt Gingrich. While governor of Arkansas, Bill Clinton signed into law an English Only bill. As President, he has described his earlier action as a mistake. Many issues intersect in the controversy over Official English: immigration (above all), the rights of minorities (Spanish-speaking minorities in particular), the pros and cons of bilingual education, tolerance, how best to educate the children of immigrants, and the place of cultural diversity in school curricula and in American society in general. The question that lies at the root of most of the uneasiness is this: Is America threatened by the preservation of languages other than English? Will America, if it continues on its traditional path of benign linguistic neglect, go the way of Belgium, Canada, and Sri Lanka -- three countries among many whose unity is gravely imperiled by language and ethnic conflicts? LANGUAGE and nationalism were not always so intimately intertwined. Never in the heyday of rule by sovereign was it a condition of employment that the King be able to speak the language of his subjects. George I spoke no English and spent much of his time away from England, attempting to use the power of his kingship to shore up his German possessions. In the Middle Ages nationalism was not even part of the picture: one owed loyalty to a lord, a prince, a ruler, a family, a tribe, a church, a piece of land, but not to a nation and least of all to a nation as a language unit. The capital city of the Austrian Hapsburg empire was Vienna, its ruler a monarch with effective control of peoples of the most varied and incompatible ethnicities, and languages, throughout Central and Eastern Europe. The official language, and the lingua franca as well, was German. While it stood -- and it stood for hundreds of years -- the empire was an anachronistic relic of what for most of human history had been the normal relationship between country and language: none. The marriage of language and nationalism goes back at least to Romanticism and specifically to Rousseau, who argued in his that language must develop before politics is possible and that language originally distinguished nations from one another. A little-remembered aim of the French Revolution -- itself the legacy of Rousseau -- was to impose a national language on France, where regional languages such as Provençal, Breton, and Basque were still strong competitors against standard French, the French of the Ile de France. As late as 1789, when the Revolution began, half the population of the south of France, which spoke Provençal, did not understand French. A century earlier the playwright Racine said that he had had to resort to Spanish and Italian to make himself understood in the southern French town of Uzès. After the Revolution nationhood itself became aligned with language. In 1846 Jacob Grimm, one of the Brothers Grimm of fairy-tale fame but better known in the linguistic establishment as a forerunner of modern comparative and historical linguists, said that "a nation is the totality of people who speak the same language." After midcentury, language was invoked more than any other single criterion to define nationality. Language as a political force helped to bring about the unification of Italy and of Germany and the secession of Norway from its union with Sweden in 1905. Arnold Toynbee observed -- unhappily -- soon after the First World War that "the growing consciousness of Nationality had attached itself neither to traditional frontiers nor to new geographical associations but almost exclusively to mother tongues." The crowning triumph of the new desideratum was the Treaty of Versailles, in 1919, when the allied victors of the First World War began redrawing the map of Central and Eastern Europe according to nationality as best they could. The magic word was "self-determination," and none of Woodrow Wilson's Fourteen Points mentioned the word "language" at all. Self-determination was thought of as being related to "nationality," which today we would be more likely to call "ethnicity"; but language was simpler to identify than nationality or ethnicity. When it came to drawing the boundary lines of various countries -- Czechoslovakia, Yugoslavia, Romania, Hungary, Albania, Bulgaria, Poland -- it was principally language that guided the draftsman's hand. (The main exceptions were Alsace-Lorraine, South Tyrol, and the German-speaking parts of Bohemia and Moravia.) Almost by default language became the defining characteristic of nationality. And so it remains today. In much of the world, ethnic unity and cultural identification are routinely defined by language. To be Arab is to speak Arabic. Bengali identity is based on language in spite of the division of Bengali-speakers between Hindu India and Muslim Bangladesh. When eastern Pakistan seceded from greater Pakistan in 1971, it named itself Bangladesh: desa means "country"; bangla means not the Bengali people or the Bengali territory but the Bengali language. Scratch most nationalist movements and you find a linguistic grievance. The demands for independence of the Baltic states (Latvia, Lithuania, and Estonia) were intimately bound up with fears for the loss of their respective languages and cultures in a sea of Russianness. In Belgium the war between French and Flemish threatens an already weakly fused country. The present atmosphere of Belgium is dark and anxious, costive; the metaphor of divorce is a staple of private and public discourse. The lines of terrorism in Sri Lanka are drawn between Tamil Hindus and Sinhalese Buddhists -- and also between the Tamil and Sinhalese languages. Worship of the French language fortifies the movement for an independent Quebec. Whether a united Canada will survive into the twenty-first century is a question too close to call. Much of the anxiety about language in the United States is probably fueled by the "Quebec problem": unlike Belgium, which is a small European country, or Sri Lanka, which is halfway around the world, Canada is our close neighbor. Language is a convenient surrogate for nonlinguistic claims that are often awkward to articulate, for they amount to a demand for more political and economic power. Militant Sikhs in India call for a state of their own: Khalistan ("Land of the Pure" in Punjabi). They frequently couch this as a demand for a linguistic state, which has a certain simplicity about it, a clarity of motive -- justice, even, because states in India are normally linguistic states. But the Sikh demands blend religion, economics, language, and retribution for sins both punished and unpunished in a country where old sins cast long shadows. Language is an explosive issue in the countries of the former Soviet Union. The language conflict in Estonia has been especially bitter. Ethnic Russians make up almost a third of Estonia's population, and most of them do not speak or read Estonian, although Russians have lived in Estonia for more than a generation. Estonia has passed legislation requiring knowledge of the Estonian language as a condition of citizenship. Nationalist groups in independent Lithuania sought restrictions on the use of Polish -- again, old sins, long shadows. In 1995 protests erupted in Moldova, formerly the Moldavian Soviet Socialist Republic, over language and the teaching of Moldovan history. Was Moldovan history a part of Romanian history or of Soviet history? Was Moldova's language Romanian? Moldovan -- earlier called Moldavian -- is Romanian, just as American English and British English are both English. But in the days of the Moldavian SSR, Moscow insisted that the two languages were different, and in a piece of linguistic nonsense required Moldavian to be written in the Cyrillic alphabet to strengthen the case that it was not Romanian. The official language of Yugoslavia was Serbo-Croatian, which was never so much a language as a political accommodation. The Serbian and Croatian languages are mutually intelligible. Serbian is written in the Cyrillic alphabet, is identified with the Eastern Orthodox branch of the Catholic Church, and borrows its high-culture words from the east -- from Russian and Old Church Slavic. Croatian is written in the Roman alphabet, is identified with Roman Catholicism, and borrows its high-culture words from the west -- from German, for example, and Latin. One of the first things the newly autonomous Republic of Serbia did, in 1991, was to pass a law decreeing Serbian in the Cyrillic alphabet the official language of the country. With Croatia divorced from Serbia, the Croatian and Serbian languages are diverging more and more. Serbo-Croatian has now passed into history, a language-museum relic from the brief period when Serbs and Croats called themselves Yugoslavs and pretended to like each other. Slovakia, relieved now of the need to accommodate to Czech cosmopolitan sensibilities, has passed a law making Slovak its official language. (Czech is to Slovak pretty much as Croatian is to Serbian.) Doctors in state hospitals must speak to patients in Slovak, even if another language would aid diagnosis and treatment. Some 600,000 Slovaks -- more than 10 percent of the population -- are ethnically Hungarian. Even staff meetings in Hungarian-language schools must be in Slovak. (The government dropped a stipulation that church weddings be conducted in Slovak after heavy opposition from the Roman Catholic Church.) Language inspectors are told to weed out "all sins perpetrated on the regular Slovak language." Tensions between Slovaks and Hungarians, who had been getting along, have begun to arise. The twentieth century is ending as it began -- with trouble in the Balkans and with nationalist tensions flaring up in other parts of the globe. (Toward the end of his life Bismarck predicted that "some damn fool thing in the Balkans" would ignite the next war.) Language isn't always part of the problem. But it usually is. IS there no hope for language tolerance? Some countries manage to maintain their unity in the face of multilingualism. Examples are Finland, with a Swedish minority, and a number of African and Southeast Asian countries. Two others could not be more unlike as countries go: Switzerland and India. German, French, Italian, and Romansh are the languages of Switzerland. The first three can be and are used for official purposes; all four are designated "national" languages. Switzerland is politically almost hyperstable. It has language problems (Romansh is losing ground), but they are not major, and they are never allowed to threaten national unity. Contrary to public perception, India gets along pretty well with a host of different languages. The Indian constitution officially recognizes nineteen languages, English among them. Hindi is specified in the constitution as the national language of India, but that is a pious postcolonial fiction: outside the Hindi-speaking northern heartland of India, people don't want to learn it. English functions more nearly than Hindi as India's lingua franca. From 1947, when India obtained its independence from the British, until the 1960s blood ran in the streets and people died because of language. Hindi absolutists wanted to force Hindi on the entire country, which would have split India between north and south and opened up other fracture lines as well. For as long as possible Jawaharlal Nehru, independent India's first Prime Minister, resisted nationalist demands to redraw the capricious state boundaries of British India according to language. By the time he capitulated, the country had gained a precious decade to prove its viability as a union. Why is it that India preserves its unity with not just two languages to contend with, as Belgium, Canada, and Sri Lanka have, but nineteen? The answer is that India, like Switzerland, has a strong national identity. The two countries share something big and almost mystical that holds each together in a union transcending language. That something I call "unique otherness." The Swiss have what the political scientist Karl Deutsch called "learned habits, preferences, symbols, memories, and patterns of landholding": customs, cultural traditions, and political institutions that bind them closer to one another than to people of France, Germany, or Italy living just across the border and speaking the same language. There is Switzerland's traditional neutrality, its system of universal military training (the "citizen army"), its consensual allegiance to a strong Swiss franc -- and fondue, yodeling, skiing, and mountains. Set against all this, the fact that Switzerland has four languages doesn't even approach the threshold of becoming a threat. As for India, what Vincent Smith, in the , calls its "deep underlying fundamental unity" resides in institutions and beliefs such as caste, cow worship, sacred places, and much more. Consider dharma, karma, and maya, the three root convictions of Hinduism; India's historical epics; Gandhi; ahimsa (nonviolence); vegetarianism; a distinctive cuisine and way of eating; marriage customs; a shared past; and what the Indologist Ainslie Embree calls "Brahmanical ideology." In other words, "We are Indian; we are different." Belgium and Canada have never managed to forge a stable national identity; Czechoslovakia and Yugoslavia never did either. Unique otherness immunizes countries against linguistic destabilization. Even Switzerland and especially India have problems; in any country with as many different languages as India has, language will never not be a problem. However, it is one thing to have a major illness with a bleak prognosis; it is another to have a condition that is irritating and occasionally painful but not life-threatening. History teaches a plain lesson about language and governments: there is almost nothing the government of a free country can do to change language usage and practice significantly, to force its citizens to use certain languages in preference to others, and to discourage people from speaking a language they wish to continue to speak. (The rebirth of Hebrew in Palestine and Israel's successful mandate that Hebrew be spoken and written by Israelis is a unique event in the annals of language history.) Quebec has since the 1970s passed an array of laws giving French a virtual monopoly in the province. One consequence -- unintended, one wishes to believe -- of these laws is that last year kosher products imported for Passover were kept off the shelves, because the packages were not labeled in French. Wise governments keep their hands off language to the extent that it is politically possible to do so. We like to believe that to pass a law is to change behavior; but passing laws about language, in a free society, almost never changes attitudes or behavior. Gaelic (Irish) is living out a slow, inexorable decline in Ireland despite enormous government support of every possible kind since Ireland gained its independence from Britain. The Welsh language, in contrast, is alive today in Wales in spite of heavy discrimination during its history. Three out of four people in the northern and western counties of Gwynedd and Dyfed speak Welsh. I said earlier that language is a convenient surrogate for other national problems. Official English obviously has a lot to do with concern about immigration, perhaps especially Hispanic immigration. America may be threatened by immigration; I don't know. But America is not threatened by language. 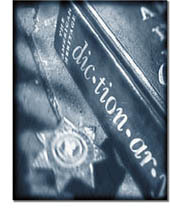 The usual arguments made by academics against Official English are commonsensical. Who needs a law when, according to the 1990 census, 94 percent of American residents speak English anyway? (Mauro E. Mujica, the chairman of U.S. English, cites a higher figure: 97 percent.) Not many of today's immigrants will see their first language survive into the second generation. This is in fact the common lament of first-generation immigrants:their children are not learning their language and are losing the culture of their parents. Spanish is hardly a threat to English, in spite of isolated (and easily visible) cases such as Miami, New York City, and pockets of the Southwest and southern California. The everyday language of south Texas is Spanish, and yet south Texas is not about to secede from America. But empirical, calm arguments don't engage the real issue: language is a symbol, an icon. Nobody who favors a constitutional ban against flag burning will ever be persuaded by the argument that the flag is, after all, just a "piece of cloth." A draft card in the 1960s was never merely a piece of paper. Neither is a marriage license. Language, as one linguist has said, is "not primarily a means of communication but a means of communion." Romanticism exalted language, made it mystical, sublime -- a bond of national identity. At the same time, Romanticism created a monster: it made of language a means for destroying a country. America has that unique otherness of which I spoke. In spite of all our racial divisions and economic unfairness, we have the frontier tradition, respect for the individual, and opportunity; we have our love affair with the automobile; we have in our history a civil war that freed the slaves and was fought with valor; and we have sports, hot dogs, hamburgers, and milk shakes -- things big and small, noble and petty, important and trifling. "We are Americans; we are different." If I'm wrong, then the great American experiment will fail -- not because of language but because it no longer means anything to be an American; because we have forfeited that "willingness of the heart" that F. Scott Fitzgerald wrote was America; because we are no longer joined by Lincoln's "mystic chords of memory." We are not even close to the danger point. I suggest that we relax and luxuriate in our linguistic richness and our traditional tolerance of language differences. Language does not threaten American unity. Benign neglect is a good policy for any country when it comes to language, and it's a good policy for America. The Atlantic Monthly; April 1997; Should English B the Law? ; Volume 279, No. 4; pages 55-64.